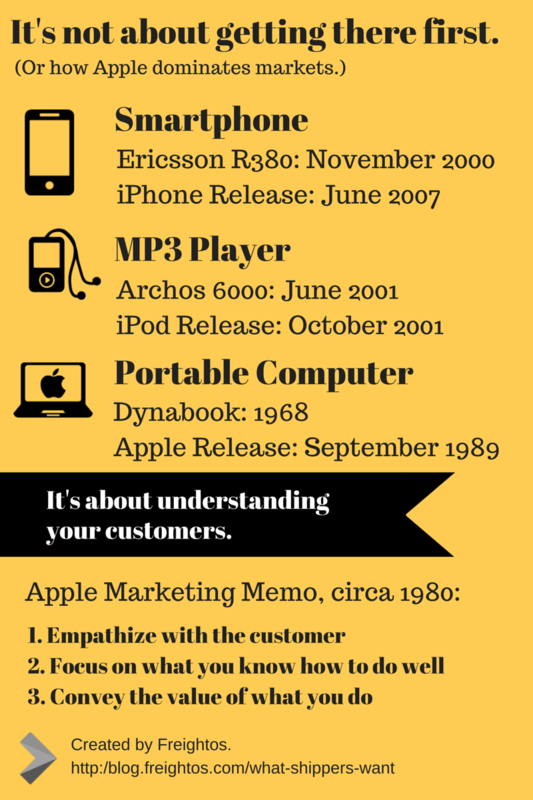 Apple didn’t invent the MP3 player, the laptop or the smartphone. And it still made a fortune on them. Which means Apple is doing something very right. And logistics vendors can do the exact same thing. But first, some history. The first iPod held 5GB of songs and was released on October 23, 2001. A company called Archos beat Apple to the punch, releasing a 6GB MP3 player in June 2001. iPod wasn’t the first to market but it dominated until the Apple iPhone replaced it. Interestingly enough, the iPhone, released in June 2007, wasn’t the first smart phone either. The Ericsson R380 Smpartphone was released in 2000, combining a cellphone with a PDA (remember those?). But that didn’t stop iPhones from dominating for years, until being given a run for its money by Android. So basically, Apple didn’t invent the MP3 player, didn’t invent the smartphone and didn’t invent the laptop. But something about the way Apple works helps them simply take off. Empathy: We will truly understand their[the customers] needs better than any other company. Impute: We may have the best product…if we present them in a slipshod manner, they will be perceived as slipshod; if we present them in a creative, professional manner, we will impute the desired qualities. Basically, Apple’s success is driven by the idea that you need to understand your customer, focus on what helps them and present your product in a way that reflects that. Brad: Why don’t you do me a favor and write your name down on that napkin for me? Jordan Belfort: I can’t, I don’t have a pen. Brad: Exactly, supply and demand, my friend. The services logistics vendors offer should be a combination of both what the customer wants and what the customer needs. Are you offering your customers what they need, what they want or what you think they want or need? Give shippers what they want and need so that you are actually fulfilling a true demand, not what you think the demand should be. Keep on reading for five research-driven insights into what shippers want. No time to read now? You can also download our free whitepaper about What Shippers Want right here. Real time, accessible information: Logistics customers want faster, more efficient service. When it comes to online services, their top priority is real-time information, followed by access to cost and shipment prices and faster responses to their requests. 40% of shippers are not happy with their forwarder’s IT capabilities. Great service: Think your customers only care about service? Think again. 86% of the time, a happy customer will be willing to pay more for a killer experience and a happy customer will refer an average of 9 new customers. Even with successful touchpoints, average customer satisfaction will drop 40% over the course of three months because of the process, not the isolated interactions. Get started on improving the customer experience here. Value add: Forwarders have a tendency to think that it’s all about price. As a matter of fact, research has found that nearly all freight forwarders instinctively begin lowering prices in early negotiation stages by 10%-30%, instead of focusing on product value. Reduced bottom-line costs: If you’re offering 3PL services, your one metric to rule the all should be how much money you’re saving your customer’s all around costs. In 2014, 3PLs helped forwarders reduce logistics costs by 9%and reduce inventory costs by 5%. Basically, you can charge more for your services as long as your services are driving value. Knowledge: When your router stops working, you’ll probably restart it. And then curse under your breath when customer support tells you to restart it. 65% of US customers agree that the most important thing they want from service providers is a knowledgable employee. There’s no replacement for a service provider that knows his business, knows his customer’s business and knows how to help optimize his customer’s business.